There’s a new Small Friend in town, and this little girl is extra small! American Girl mini doll Kit Kittredge found her way into the MSF collection this week! The Beforever minis are available on the American Girl website, but I have consistently found them to be a few dollars less expensive on Amazon . I’ve also spotted the minis on the Barnes & Noble website and retail stores, Walmart.com, Costco and Sam’s Clubs, and occasionally in Target stores. The packaging and pricing may vary, along with the size of the included book(s). The online pricing for these dolls tends to bounce around, so keep your eyes open for a good deal. For example, as of this writing, the Beforever Rebecca mini doll is $17.58 on Amazon while the rest of the AG minis are $21 or more. 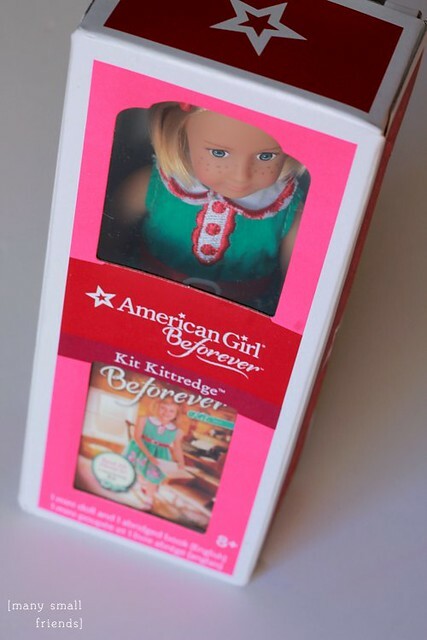 As with most of the historical collection, Beforever brought changes to the American Girl minis. Most notably, all of the face molds were updated and the dolls’ torsos are now made of vinyl instead of cloth. Additionally, if the full sized version of the Beforever doll got a new meet outfit, so did her mini counterpart. The mini abridged books that accompany the dolls were also updated, but this “update” can only be considered a “downgrade”. In the photo below, the book “Really Truly Ruthie” came with the previous version of the mini Ruthie doll, while the Beforever Kit book, “Read All About It!” is the new mini book format. Not only have the new Beforever mini books become considerably more miniature, but they have lost their hard cover, accompanying dust jacket, and illustrations, too. Pfffft. I like the face mold updates on all of the new minis, especially Kit’s! Beforever mini Kit looks younger and sweeter to me. Neither version exactly replicates the full sized doll, but in my opinion, the new Kit better captures the essence of the character. Below is a video review of my new mini Kit. Included are a few more pictures and comparisons to the previous mini dolls and a look inside the mini books as well. 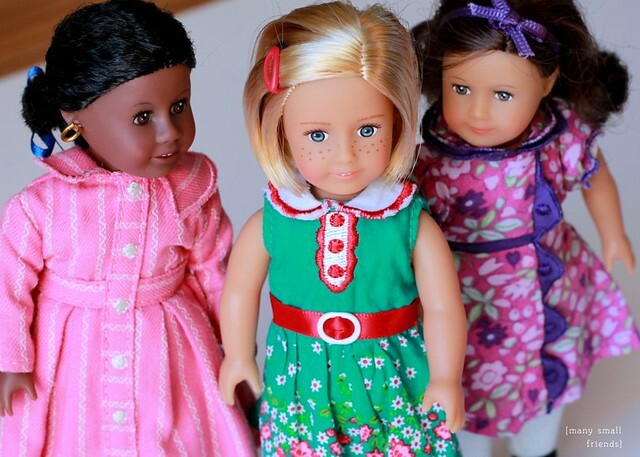 Have you added any of the Beforever mini dolls to your collection? I’d love to hear your opinions on the changes. I’m really enjoying my new mini Kit but ultimately I do wish she had the older style squishy cloth body and the hardcover illustrated book. This entry was posted in Doll Review, Doll Video and tagged American Girl Dolls, Beforever, Doll Review, Doll Video, Mini Dolls.